By downloading an app and completing a simple registration, you gain instant access to the charging stations in your area. The registration process is very fast, without you having to enter detailed information. Notification system will let you know, while your charging is reaching the end or it's already done. You can also ask other drivers about their estimated charging time. 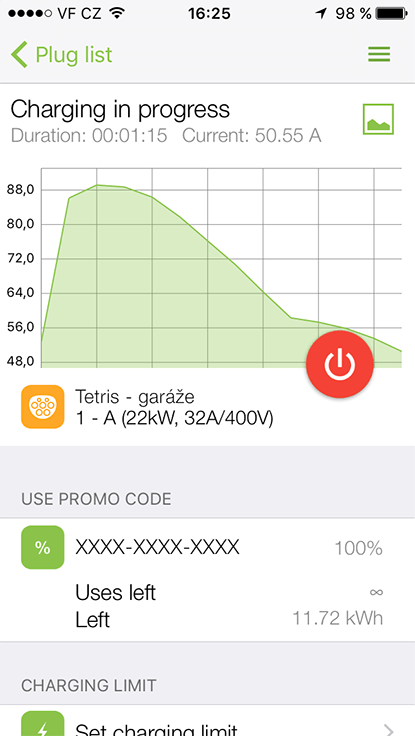 Throught the mobile application you can have access to all the information about your past charging including energy usage, price, payment method and also charging graph. For every transaction there is an available invoice document for download. 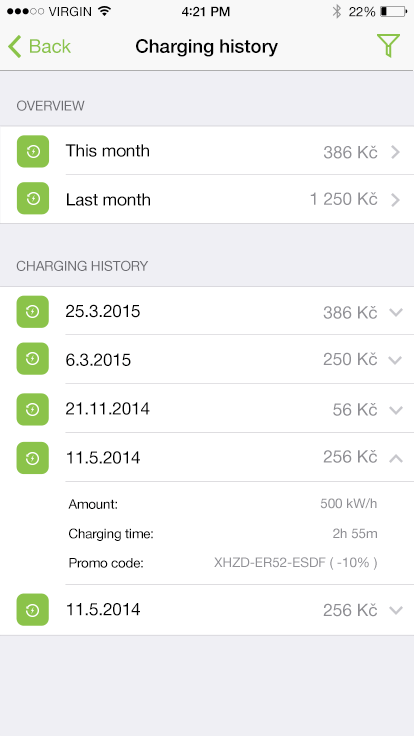 Keep track of the ongoing charging. 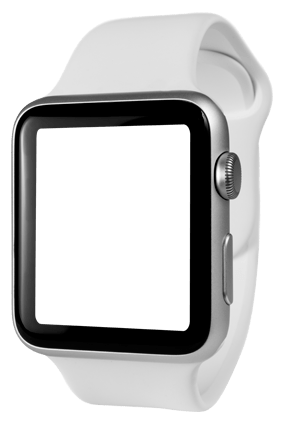 Pair your Smartwatch with your phone and gain access to all the important information, including a chart and notification even faster. You can find a suitable station from the station list ordered by distance from you actual position or you can view them on the map. 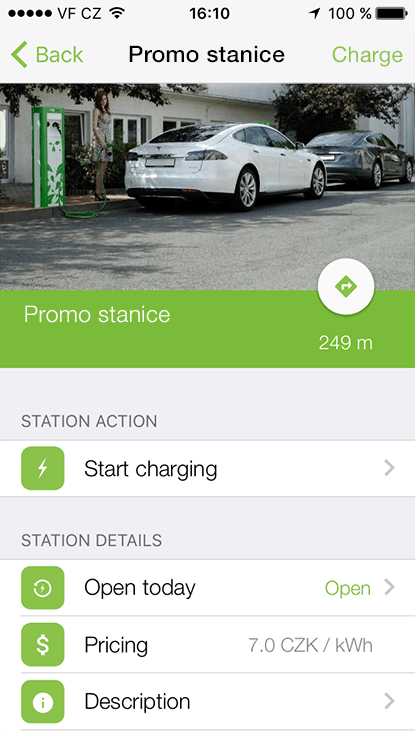 The key action is the selection of the station where you intend to charge your electric vehicle. Select a suitable station from the mobile application. Each station contains information about the sockets installed, so you can always see whether it supports your vehicle or not. Each station updates its status continuously so you can see if the station is available, closed or being used. Do you want to know what is the maximum output of the station or other technical parameters? You can find them in station detail throught the mobile application. 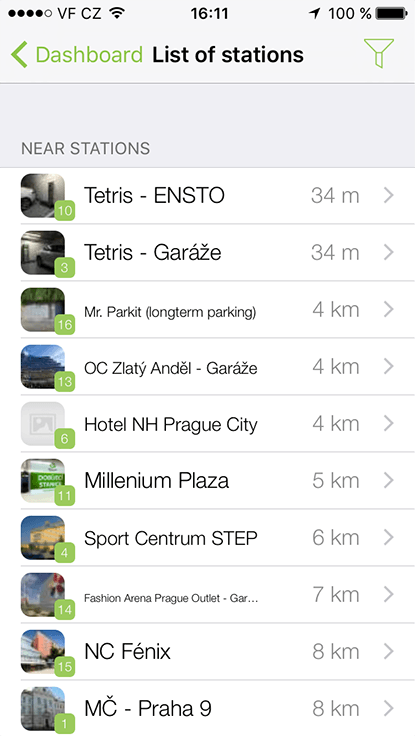 After you find suitable station you can navigate there by using your favorite application. For quickest way to find nearest station use the "Find nearest" button on the main screen. Alternatively you may automatically display the closest station when the application starts in the settings. Prices for consumed energy may vary for each station. You can see the information about the pricing in the detail of station. Stations located in the places with low GSM singal are provided with Wi-Fi connection. For more information on how to connect to the hotspot see the detail of station from the mobile application. By selecting a station from the list, scanning the QR code or loading the NFC tag, the control screen of your charger appears in the app. Select the appropriate unit and the corresponding socket to which your electric vehicle is connected and press the button to start charging. 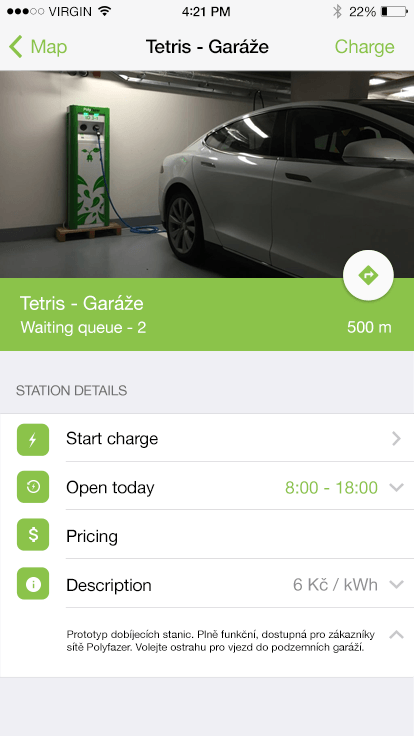 Not only that you have access to the information on the amount of energy used, its cost and voltage during the charging process you can also see an accurate picture of which phase of charging the electric vehicle is at. 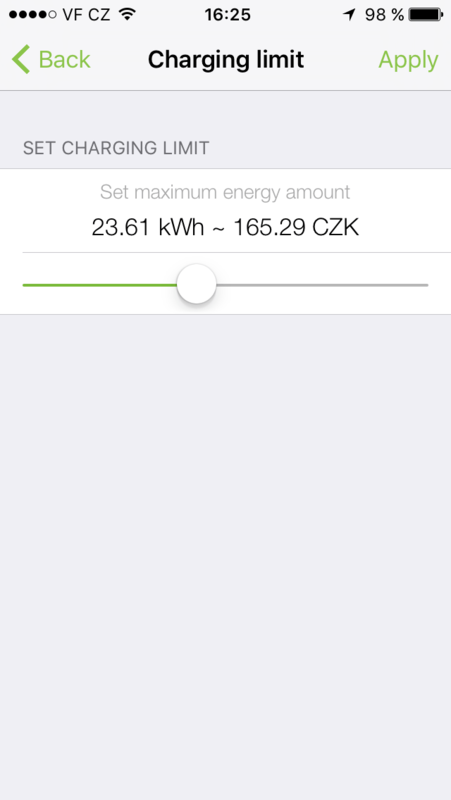 You can set the limit the maximum kWh wishing to recharge. 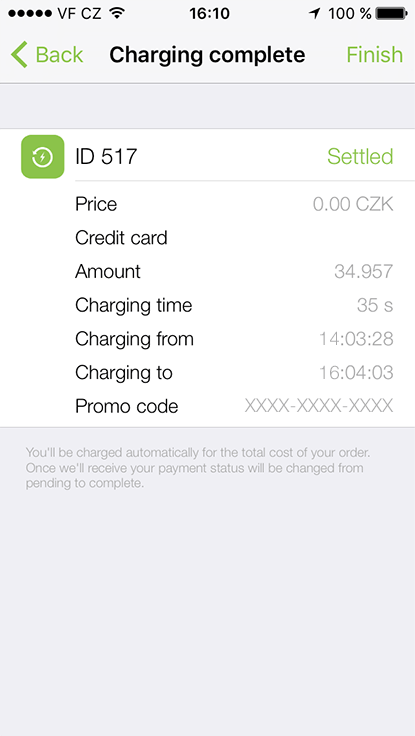 When the limit reaches the end your charging will be terminated automatically. 1. 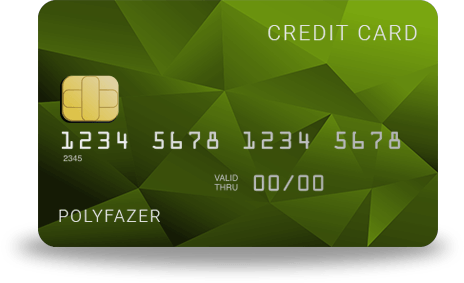 Payment card - card payment will be made automatically when charging is finished. 2. 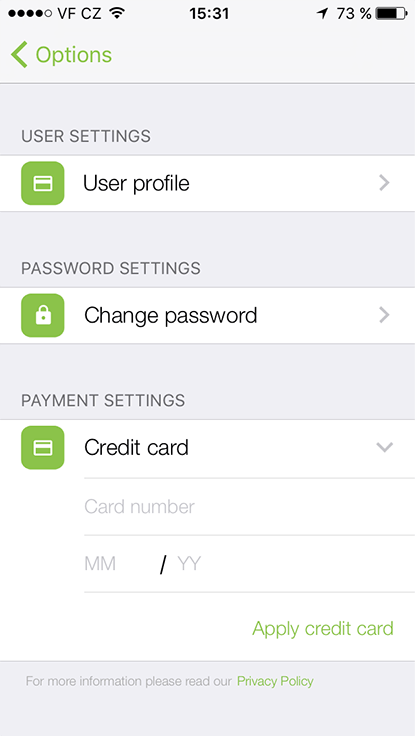 Premium SMS - in the app, select the amount of credit for energy required and send the message. The purchased credit will be automatically credited to your account in the form of a discount coupon. 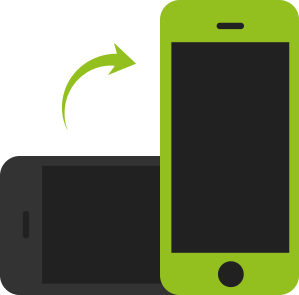 The mobile app provides access to all information on all transactions made, including the amount of energy consumed, its price, payment method used, and a charging process chart. For each transaction there is also an invoice document available for you to download. 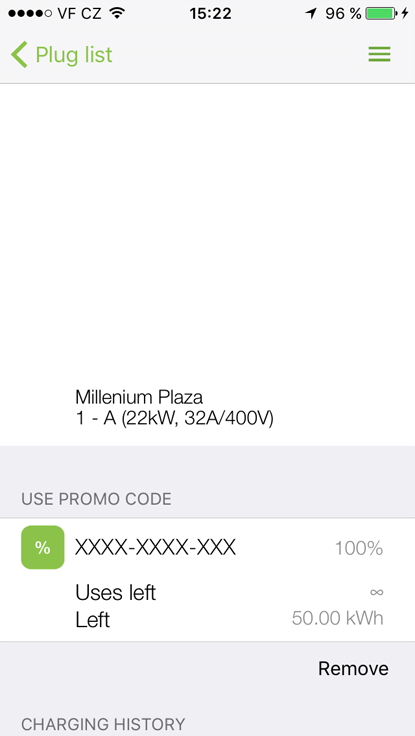 Some owners offers promo coupons for consumed energy to their customers. 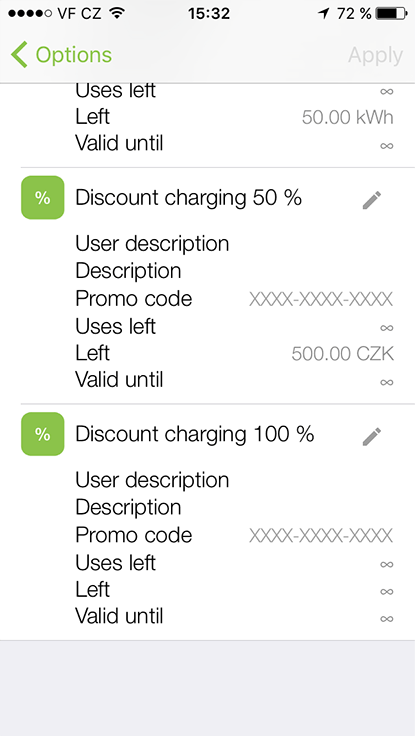 Coupons may be applied before you start the charging. Connect your EVC (Electric Vehicle Charger) to a global system. We will sort out the complex legislation and enable you to easily and quickly expand your clientele. We are offering the right solution for those thinking about building their own EVC. There is no need to sign a complicated contract. We provide an efficient billing system and payment card integration as well as premium SMS services. Tariffs - different pricing for every station. Easy access to your EVSE for every EV driver. 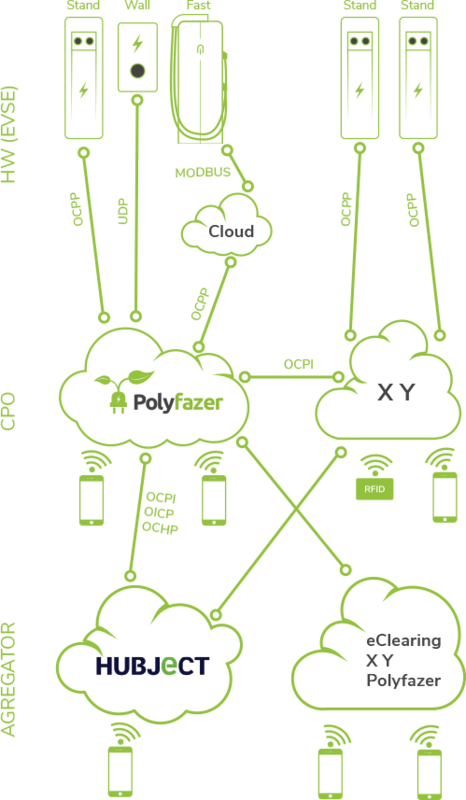 Integration into aggregation networks such as Hubject. A complex tool for monitoring and controlling your EVCs in the form of a smartphone application is provided. 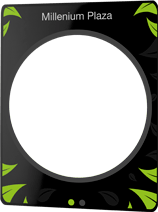 Support for Open Charge Point Protocol (OCPP) versions 1.5 and 1.6, Open InterCharge Protocol (OICP) and Open Charge Point Interface (OCPI). Implementation is simple. We’ve tested most of the available charging stations on the market (Keba, Ensto, ABB, Micos, VoltDrive, Nikola, Eluminocity and many more). Need more information? Would you like to use our system with your stations? Or are you looking for a station for your property? We will gladly answer all your questions or find suitable solution. Just contact us using the form below. Are you a charging network operator or are you looking for a station to your property?